The popularity of the Ford Transit Connect cargo van for the tradesman who’s looking for a small, affordable service vehicle can’t be denied. Despite its small size, you can still carry a full-size ladder with the help of a Ranger Design Ford Transit Connect Ladder Rack. Designed for easy one person operation, all of our Ford Transit Connect ladder racks are roof mounted and made of heavy duty rust-proofed aluminum that’s strong and durable. They use stainless steel mounting hardware and have an attractive powder coated white finish that ensures no corrosion over the lifetime of the rack. They are contractor proven tough and can withstand the punishing environments that tradesmen will put them through. They work hard and pay for themselves by helping tradesmen save time and money. Ranger Design has a Ford Transit Connect ladder rack that can meet the demands of any serviceman or any trade. At Ranger Design, we have more than one style of Ford Transit Connect ladder rack, but all can free up valuable interior cargo space while helping tradesmen work more effectively and safely. A well designed Ford Transit Connect ladder rack can offer many advantages to the tradesman beyond just loading and transporting ladders, they’ll help you get the most of your Transit Connect. Regardless of which Ford Transit Connect ladder rack you choose, we are so confident in their rugged, heavy duty construction that we back them with an industry leading 10-year warranty. 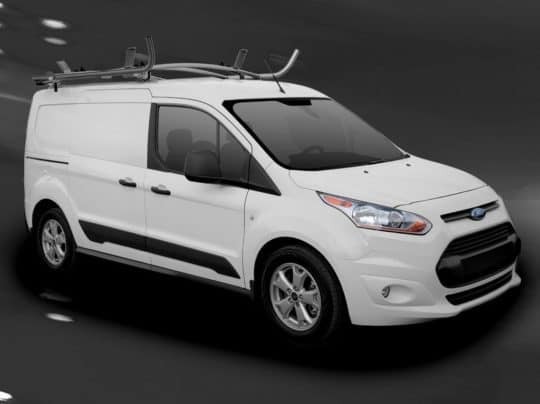 We have a Ford Transit Connect ladder rack that will meet your needs, as well as a full line of accessories and trade solution packages for the Ford Transit Connect. Click here to return to the Transit Connect page. To find out more, contact one of our world class product specialists who are standing by now to answer your call: (800) 565-5321. You can also contact us or request a quote.